- Used to remove the gas molecules from sealed volume. A continuous discharge vacuum pump is a completely self contained unit. Two nos. Matted areas can be dewatered in one single operation. The pump is powered by 7. 5 h. P 3 phase electric motor. 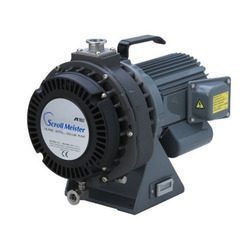 The company procures these Vacuum Pumps from the proficient vendors of the market. We have highly-dedicated team of quality checkers for examining the quality of the Vacuum Pump. The Vacuum Pump, offered by us, is used in several industrial applications. We offer best of the best variety of Couple Type Vacuum Pump to our customers. Swam dry screw vacuum pumps are designed under SWAM's unique screw profile engineering to fulfill wide range of chemical and industrial processes. It is operating by rotating a paired screw that efficiently admit gases from inlet into the pump inside and compress through the screws swept volume toward the discharge. Our vacuum range includes single or multi-stage vacuum pumps, flat and bellows cups, vacuum switches and accessories.